Imagine a vast, intergalactic empire with Earth as its capital. Gargantuan starships hurtle through space, traveling at velocities approaching or even exceeding the speed of light. Through commerce, exploration, and occasionally military conflict, humanity continues to expand its power in the galaxy. Now what could all this have to do with a word like jiffy? Sometime around the turn of the 20th Century, physical chemist Gilbert Newton Lewis proposed jiffy as a unit of time defined as the amount of time it takes light to travel one centimeter in a vacuum. As far as I can tell, the term never caught on and is now a mere footnote in the scientific lexicon. However, the way jiffies are defined, with their relationship to the speed of light, has some interesting implications in a universe governed by special and general relativity. According to relativistic physics, our perception of time changes in relation to velocity, acceleration, and even gravity. If you hate time zones and jetlag, just think how much more complicated things might be in a futuristic space empire with starships zooming about the galaxy, experiencing time in different ways relative to each other and the rest of the universe. 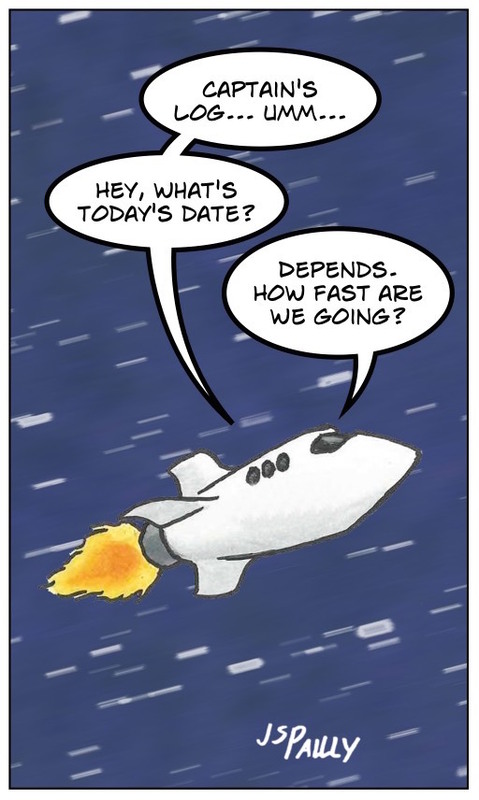 I don’t know if jiffies (along with kilo-jiffies, mega-jiffies, etc) would ever be accepted as a regular part of space traveler jargon, but the relativistic effects of space travel might necessitate a whole new standard for measuring time, with a specialized system of units defined in relation to the speed of light. Maybe something similar to Gilbert Newton Lewis’s jiffy would be a good place to start. Posted by J.S. Pailly on May 15, 2015 in Sciency Words.